Much like Holiday Hangover, NaNoWriMo hangover has already set in. We've reached the end of this crazy month and all that's left for our projects is tedious revision. Yuck. Instead of jumping into that, I've been lounging, eating junk food and watching a lot of TV. Our house got struck by illness a couple of weeks again and it's happened again. I spent most of Monday in a NyQuil and fever induced daze in bed. Luckily that was the worst day, but I still have a sore throat. Nothing like answering the phone and sounding like a 70 year old smoker. If you have Amazon Prime, you HAVE to watch this show. I'm not a huge fan of a lot of the stuff that Amazon Prime Originals put out, but this one knocked it out of the park. It was released on Wednesday and I stayed up late into the night watching it. Probably not to the best ideal when you're recovering from a cold, but it was worth it. 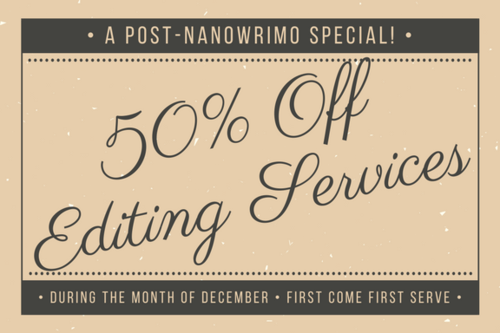 As a Post-NaNoWriMo special, all my of editing services are half off in December. I've already had requests come in, so if you're interested, head over to my contact page and give me the details about your project. I have a number of different packages available to fit every budget. This deal is only available first come first serve as my time allows, so don't take too long to reach out. I focused all month on #NaNoWriMo2017 but had lots of ideas for my #flashfiction and #shortstories - now I'm overwhelmed by the ideas and not sure where to start! #whyimnotwriting I have no clue how these protagonists can realistically survive this invasion at the end of the book. How the heck are they still alive? #WhyImNotWriting? Because the project I decided on for NaNoWriMo opened too many closed, emotional wounds.